With contributions by Ralf Becker, Sven Ellmers, Jakob Falkinger, Michael Hampe, Thomas Lehr, Tina Röck, Sebastian Spanknebel and Gesa Wellmann. A defining feature of contemporary society is the constitutive role of the market. Pre-bourgeois societies were characterized by a system of (family) self-sufficiency and personal dependencies, which is why markets were allowed only as a marginal phenomenon – a marginal phenomenon that was characterized by the doctrines of tradition and religion. By contrast, bourgeois societies replace personal dependence with the objective dependence of private owners. Markets therefore no longer complement other modes of production; instead they take over the position formerly held by the latter. If we assume, following Aristotle and Hegel, that in our everyday actions we are less guided by cognitively accessible principles than by attitudes that we have internalized through social routines, then it would seem reasonable to conclude that markets also stamp our personalities to a much greater degree: they influence how we perceive ourselves and our fellow human beings, what each of us expects of him- or herself and of others, and how we treat ourselves and our fellow citizens. This article will initially argue that markets especially foster narcissistic dispositions and will then go on to discuss two possibilities of market limitation. Although Kant is often considered the philosopher who ended the reign of metaphysical dogmatism, the situation is not quite so clear. On the one hand, this analysis must bear in mind that Kant himself had a great interest in metaphysics, insofar as it was not dogmatic – Kant himself considered his Critique to be just a reform of metaphysics. On the other hand, the Critique of Pure Reason itself is a result of certain metaphysical-dogmatic preliminary decisions. In order to show how one-sided the idea is that Kant simply did away with metaphysics, I will draw attention to the metaphysical presuppositions that shape the Critique of Pure Reason. The first thinker who attempted to explicate the metaphysical basis of the Critique was Kant’s friend and colleague Johann Georg Hamann. 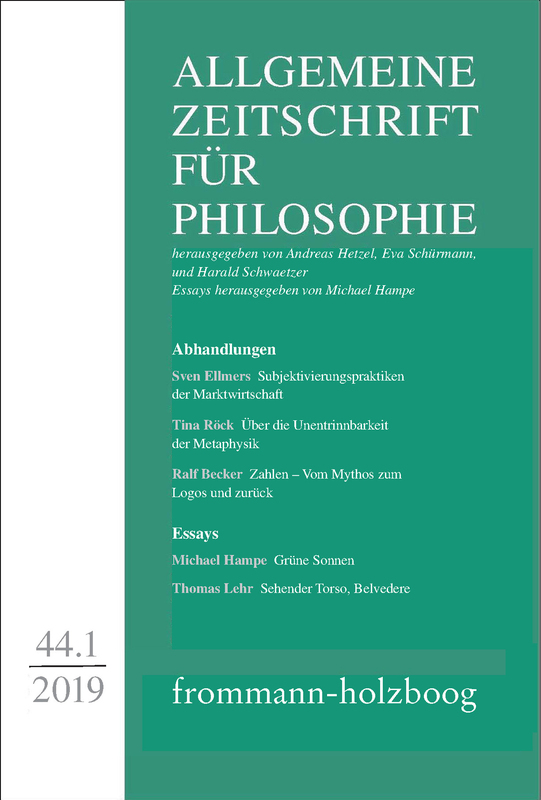 With Hamann’s guidance I will argue that even his Critique of Pure Reason was based on metaphysical presuppositions and that such an influence by metaphysical preliminary decisions is inevitable – even for such a sharp critic of metaphysical dogmatism as Kant. At the same time this text provides an introduction to Hamann’s thought, a thinker ahead of his times. Gesa Wellmann: Was ist Geist? Jakob Falkinger: Hin zu einer angemessenen Philosophie des Politischen?